Bob moved to Gulf Shores, Alabama from New Hampshire in 1981 and immediately fell in love with the area and its beautiful climate. He has been selling Gulf Shores & Orange Beach real estate for 30+ years. 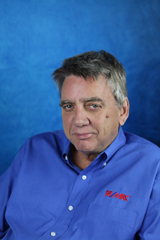 Bob joined RE/MAX in the early 1990's and in 1994 he took over ownership and management of RE/MAX of Gulf Shores and Orange Beach. By 1998 these RE/MAX offices were the #1 RE/MAX offices in the State of Alabama, a feat repeated in 5 of the next 6 years. Then in 1999 RE/MAX of Gulf Shores was the #1 RE/MAX office World-Wide. After selling RE/MAX of Gulf Shores and RE/MAX of Orange Beach in June of 2004 Bob and Susan opened RE/MAX Paradise. This has allowed Bob to concentrate on what he really loves to do - market real estate in South Baldwin County Alabama. Bob is licensed in Alabama and Florida and he has built his business based on developing relationships that foster life-long clientele. As a professional Realtor I hold a Broker license in addition to having the CRB designation (only 3% of Realtors have met the requirements to obtain this designation) which exemplifies the highest level of professional achievement in real estate brokerage management.